Do your cats love tall, vertical structures? Mine do. Do you think they would love to have something of their own, very tall, to climb, play and sleep on? That might be a silly, unnecessary question, but if the answer is yes then you will probably want to read about this cat tree condo. 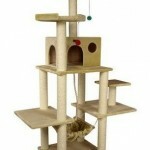 It’s also very affordable considering that it’s the tallest cat tree we review on this site. 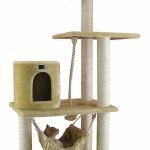 When we mention that this cat tree by GoPetClub is 92″ inches tall, that is actually the minimum height. The top pole is actually adjustable between 92″ and 106″ – allowing you to attach it to a ceiling to for maximum stability. The structure is built out of plywood, and is covered in a very soft faux fur covering that your cats will find to be very comfortable. It is sturdy and well built to handle all size of cats, small and large. The scratching posts are wrapped tightly in sisal rope, and your cats will love scratching on these posts. 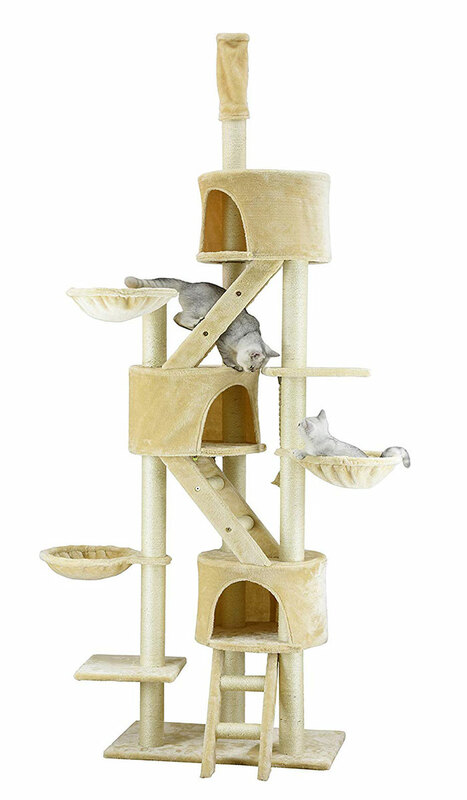 With several platforms, three houses (with ladders) and scratching posts all over the place, this is a great cat tree for anybody with multiple cats or even just one or two very adventurous cats. Cats that love to climb and scale will find this especially satisfying, and it will fit easily even in a small apartment if needed. Customers are happy after buying this cat condo, and find that their cats love sleeping and playing on it! Their cats love sleeping in both the houses and the baskets, even if it took them a little while to warm up to the whole thing. Many people who buy this find that their cats immediately start scratching on their furniture less and instead scratch on the sisal wrapped posts. This is a major benefit of any cat tree. Many reviewers comment that the instructions are horrible, and that would be the one negative point that is brought up all the time for this product. That is ok though, because it’s still not that hard to figure out, and even if you just look at the product photos and study them you can easily work out how to put it all together. One reviewer even mentioned that he found it best to build this from the bottom up, and to work mostly by looking at the product photos. Another reviewer mentions that the instructions are fine though if you just look at them in detail. And the same person also says to just make sure you have the base and the condos facing the right way to avoid issues. Even with poor instructions, pretty much all buyers are able to get it assembled in less than an hour with less than a half hour being possible. Some people say that they find the ladders to be unnecessary, and some people even remove them after having them attached for a while. You may want to start out with the ladders attached and see how your cats like it though. It’s always ok to modify a cat tree if needed, just make sure that you don’t weaken the structure at all and you will be fine. Overall, people that buy this cat tree like the fact that they get so much structure for the price.